We influence public policy through education and advocacy. Volunteers manage everything from coordinating programming to managing all the details needed to run our organization. Find the right fit for you! We'd love your help! Each year the League decides what topics they want to study and forms a group of volunteers to pull it all together and present the findings. You do NOT need to be a member to help. From monthly meetings to candidate forums, we have a full range of events to fit all the different interests. Come to one or all of them! Observers play a key role in the League of Women Voters' mission by attending local government meetings and providing reports to keep all the League members informed. The League provides many voter services and could use your help! Services include voter registration drives, mock elections at high schools, candidate forums, and more. We've compiled a list of elected officials at the national, Illinois, and local Tri-County levels along with helpful voter resources. You don't have to be actively involved to be a member! Did you know your membership helps determine how many people we can send to the annual conventions? More members means more people can participate! 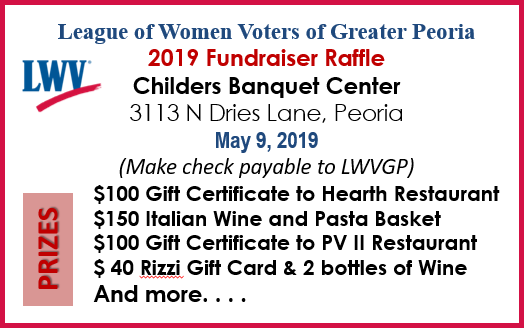 Members of the League of Women Voters of Greater Peoria automatically belong to LWV of Illinois and the national LWV organization too. 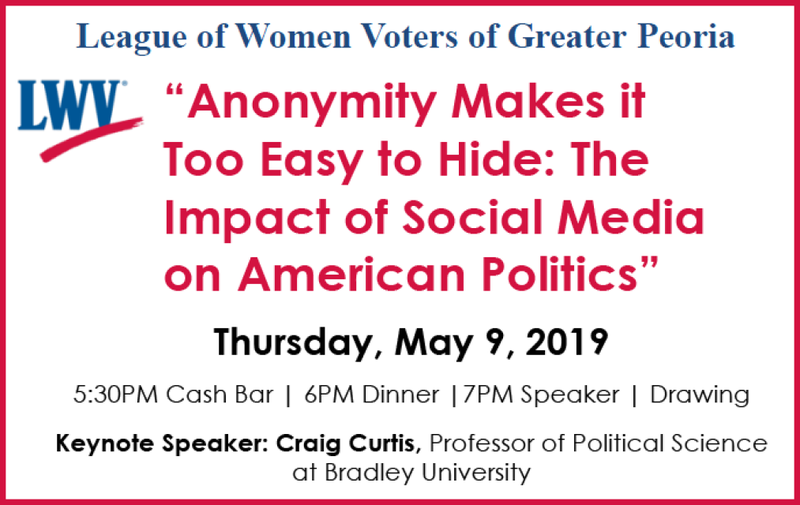 In fact, 100% of the regular dues ($62) goes to the LWVIL and LWVUS. The only way our local chapter raises money to pay for operating expenses is through the Defenders of Democracy memberships, fundraisers, and donations. Issues are defined where activity is anticipated at the state legislative level—​issues where we have strong member interest and an opportunity for the League to make an impact. The work of local Leagues is guided by these positions. The details of LWVIL's current positions can be found in Where We Stand 2015-2017.